Managing Differences in the Supervisor-Candidate relationship? 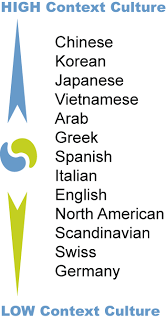 This is a guest post from Dawn Gilmore (@dawngilmore) on intercultural communication. With the global academic market, you are more and more likely to be an international student or post-doc; or be supervised by an international academic. Knowing how to communicate is really important. Last week I meet with a PhD student at the final stages of his candidacy. His visit to Academic Skills appeared to be because of a need for feedback on his writing which was not being met elsewhere. I come across these students frequently…or so I thought. Through conversation, I discovered that I had met the perfect graduate student. My advice, because he was already doing everything we encourage students to do, would no doubt be challenged over the hour and subsequent time that we would spend together. These are the students that make one-on-one consults fun! The appointment was cruising along when I responded to his question with, “Have you asked your Supervisor about that?” And that’s when the issues started to emerge. At this point in the conversation it became apparent that this student was in a stand-off between a high context and a low context culture. 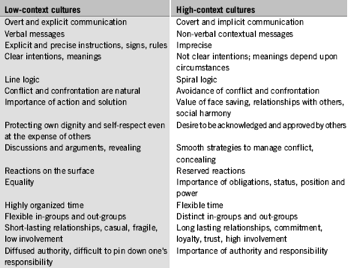 According to the work of Hofstede (1993) and Hall (1976) this archetype pair was from the opposite ends of the continuum. And after three years of mismatched expectations (see McClean and Ransom 2005) they were at yet another impasse. Within 48 hours I received a phone call from a private number. It was my student. This article provided him with insights to his relationship that would have been helpful three years ago. He proudly announced that he had photocopied the article and shared it with everyone working in the lab. So now we’re sharing it with you! Thanks to Dawn for sharing her experiences! McLean, P., & Ransom, L. (2005). ‘Building intercultural competencies: Implications for academic skills development’. In J. Carroll & J. Ryan (Eds. ), Teaching International Students: Improving learning for all (pp. 45-62). Park Square: Routledge. Hall, E T., (1976) Beyond Culture. Ann Arbour: University of Michigan Press.